Here's James Garvey's review of Animalkind in the curent issue of The Philosophers' Magazine. I really appreciate his tolerance for shades of grey. Our thinking about animals is a mess. We moo at a cow in the countryside, maybe pat a little lamb on the head, then enjoy burgers and kebabs for lunch. Philosophers have tried to tidy things up in two ways. The old school argues that animals are more like things than people, so why not treat them as we wish? Recent philosophers say that animals are like us in some morally relevant sense, and we must therefore treat them with the respect owed to human beings. Liberate them from zoos, labs and factory farms, give them rights, and so on. My fellow blogger and tpm columnist, Jean Kazez, explores a middle path between these views in her book, Animalkind. Animals aren’t just things, she says, but they’re not our equals either. Our lives matter more, but animal lives do still matter – we have to treat them with all due respect, depending on the value their lives have. It’s complicated – and you have to think things through carefully, case by case. Kazez takes the world’s ragged edges seriously. The result is a readable, compelling, and thought-provoking account of our difficult relationship to animals. Some animals are like us in some senses, not at all like us in others. Marshalling evidence, she says that mammals, birds and fish are almost certainly conscious, but creatures like ticks are probably not. Some animals seem to do some thinking – not human thinking but still thinking – while others don’t. The jury is out on whether certain creatures have a sense of self. Different interpretations are possible concerning the future-directed thoughts of animals. There’s no such thing as chimpanzee moral philosophy, but there’s enough fairness and reciprocity in their behaviour to give us pause. Kazez’s point is that sharp lines separating animals and people are hard to find – we have differing abilities and complex similarities. Animal defenders and their opponents see clear boundaries and obvious facts which lead to loud but conflicting conclusions. Kazez sees many shades of grey, all the while guided by a certain notion of respect. She arrives at it by thinking about the different capacities creatures have. “If capacities are what give value to a life, then to compare animal and human lives, we must compare animal and human capacities.” We have a large number of valuable capacities. We can think about the future and the past, about ourselves and others; we have culture, aesthetic abilities, language – and some animals have some of these capacities too, to varying degrees, and other abilities as well. All of this adds value to animal lives, but human lives are especially valuable in comparison. Animals are somewhere on a sliding scale below us, deserving of consideration depending on their particular abilities. We are not all equal, but animal lives are nevertheless worth something. Human lives, though, are worth more. The respect we owe animals depends on a complex view of values. The caveman is right to spear the proto-cow, because his family is owed more respect than his prey. Rescue parties are right to save humans before animals, because people are owed more respect than pets. But when we kill animals for something that is not worth the loss of their valuable lives, we are not treating them with the respect they deserve. No ivory trade, no hunting for fun, no leather, no fur hats, no unnecessary animal testing, and no eating meat just to satisfy a taste for it. Even this final conclusion about our dietary choices is a complicated one. Eating meat because you like the taste is closer to killing for a pretty pelt than a worthwhile medical experiment. However, and this line really got me, “For most people, being good is a work in progress, never to be completed.” Kazez knows that we struggle to be good, and it’s not an all-or-nothing affair. She tells us a lot about her own efforts, including her inability to give up milk with her cappuccino. Some dietary choices are imperfect but still better than others. There’s no easy answer on any page of this book. There’s no jargon, symbolic notation, or numbered distinctions – just plain, clear English. 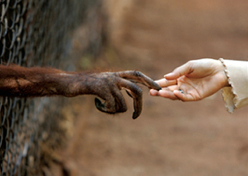 You are as likely to hear about recent primate studies as the views of philosophers. It presupposes curiosity and intelligence but no special background. It’s the effort of a philosopher doing honest work in the world. Go ahead, but remember, authors are people too. Whimper. Oh nothing like that. I liked the book and, in particular, that you did a good job with accessiblity of the ideas. But I do want to take on the animal consciousness stuff, but not in a polemical way. “If capacities are what give value to a life, then to compare animal and human lives, we must compare animal and human capacities.” - IMHO, for understanding human consciousness and intuitive social skills like empathy etc., a look at hints from paleoanthropology would be usefull.